Robinson Cano and Mariano Rivera are gone. Derek Jeter is old. It's time to accept that 2013 wasn't a fluke: The Yankees aren't good, and they aren't getting better. Once upon a time, there were two great teams in the American League East. But one was greater: In 1998, the Boston Red Sox won 92 games, the second-most in the AL … and finished 22 games behind the New York Yankees, who won 114. That was the first of eight consecutive seasons in which the Red Sox finished second in the AL East while the Yankees finished first. It became an immutable law of baseball, right up there with “each team has 27 outs” and “closers shall not pitch in tie games.” No two teams in major league history have ever finished 1-2 in as many consecutive years. The Red Sox ended their World Series drought in 2004, but they didn’t break their streak of second-place finishes until 2006, when they finished third, a single game behind the Toronto Blue Jays. The Sox really disrupted the natural order the following year, winning the division for the first time since 1995, relegating the Yankees to wild-card status, and then winning the World Series for good measure. The Yankees completed a counterrevolution in 2009, again winning the AL East ahead of the Red Sox, and then taking the World Series. If there was a wrinkle in the Established Order of Things in the AL East as recently as a year ago, it came from the Red Sox, who in 2012 finished last for the first time in 20 years and lost their most games (93) since 1965. The Yankees, meanwhile, won the division again. As I chronicled before last season, however, the Yankees were on the precipice of collapse. They finished in third place in 2013, missing the playoffs for just the second time in 19 years. The Red Sox, having made a convincing case that Bobby Valentine was the worst manager of the 21st century, delivered the best regular-season1 and postseason record in baseball after being freed from his clutches. After winning their third World Series in a decade, the Red Sox appear well positioned to keep their success going. They’re not a particularly old team. Last season, David Ortiz was the only lineup regular older than 32. Dustin Pedroia, one of the best second basemen in baseball, signed an extraordinarily team-friendly eight-year, $110 million extension. Boston’s farm system is one of the game’s best: Jackie Bradley Jr. is ready to take over in center field for the departed Jacoby Ellsbury, while phenom Xander Bogaerts, who started every game of the World Series after playing just 18 games in the regular season, is slated to replace Stephen Drew at shortstop. The melding of money and talent, the “$100 million player development machine” that former Boston GM Theo Epstein talked about more than a decade ago, continues unabated in New England. Things in the Bronx are … not as great. As tempting as it might be to label 2013 a fluke and say the Yankees will soon return to winning 94 games every year, as they did in 11 of the previous 12 seasons, the evidence points in a different direction. Last season wasn’t a fluke; it was the new normal for the Yankees, and nothing they’ve done this offseason changes that. If anything, the moves the Yankees have made this offseason seem guaranteed to perpetuate that reality. Let’s start by talking about the 2013 Yankees, because to understand how difficult it will be for the Yankees to return to glory, we need to understand how deep of a hole they’ve dug for themselves. We need to understand that last season’s Yankees were both disappointing and incredibly lucky. The Yankees were not a good team in 2013. Their Pythagorean record, an estimate of what their win-loss record should have been based on their runs scored and runs allowed,3 was 79-83. They won 85 games and stayed on the fringes of the playoff race for most of the year because of their incredible performance in one-run games, in which they were 30-16. Success in one-run games comes down to two parts luck and one part bullpen. Luck, as the Baltimore Orioles showed the last two seasons,4 is fleeting. As for the bullpen: The Yankees just lost the greatest reliever in baseball history to retirement. Good luck replicating that record next year, gentlemen. Despite playing in a park that’s favorable to hitters, the Yankees finished just 10th in the league in runs scored. Age (Ichiro Suzuki was 39 and played like it), injuries (Mark Teixeira played in 15 games, Curtis Granderson in 61), the combination of both (Derek Jeter), and Shakespearean tragicomedy (Alex Rodriguez) rendered more than half of the Yankees’ projected lineup useless, and the team had already punted on one of the other four spots when it let Russell Martin leave as a free agent so it could inexplicably play Chris Stewart behind the plate instead. Even before the season began, things were so desperate that the Yankees traded for Vernon Wells — and then gave him more than 400 at-bats. Jayson Nix, Eduardo Nunez, and Lyle Overbay composed three-quarters of the team’s primary infield. Of the nine players who batted the most for the Yankees in 2013, only two managed to post an OPS of even 700. The Yankees — the Yankees! — had just two everyday hitters who didn’t stink. The Yankees knew they needed to add hitters this winter, and they’ve done that. The sheer amount of ground their lineup has to make up, however, is staggering. Now, let’s talk about those upgrades. A year after the Yankees were unwilling to beat the Pirates’ offer to Martin of $17 million for two years, they’ve conceded that the rules of baseball do indeed require teams to field a catcher; now, they’ve committed $17 million per season to Brian McCann for the next five years. McCann is obviously a better player than Martin; McCann is one of the best-hitting catchers of the last decade and has led all active catchers in home runs since he debuted in 2005. As a left-handed hitter with a pull stroke, he’s perfectly suited to the new Yankee Stadium. But he’ll be 30 on Opening Day, and his last two seasons were his worst since 2007. To shore up right field and DH, meanwhile, the Yankees signed Carlos Beltran to a three-year, $45 million contract. If you’re looking for someone to criticize Beltran, you need to look elsewhere. In a fair world, Beltran is already a future Hall of Famer. He’s an eight-time All-Star, the premier power/speed guy of his era (he’s one of just eight players in history with 300 homers and 300 steals), and arguably the greatest postseason hitter of all time. He’s coming off a successful two-year stint in St. Louis, and though he turns 37 in April, he may still have some gas left in the tank. But his speed and defense have been in decline for years, and he will give back some of the runs he produces if the Yankees make him play the field. 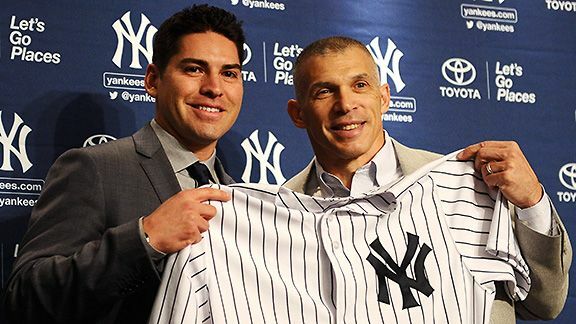 Finally, there’s the Yankees’ biggest signing: Ellsbury, whom New York has guaranteed $153 million to man center field for the next seven years. Ellsbury is an excellent defender and perhaps the best base stealer in the game (in 2013 he led the AL in steals for the third time, getting caught on just four of his 56 attempts), and he was one of the best players in baseball the one year he hit for power. That’s the main question with Ellsbury, though: How can we reconcile the player who hit 32 homers in 2011 with the player who hasn’t reached double-digit home runs in any other season? It wasn’t just homers, either; he hit 46 doubles that year, but has no more than 31 in any other season. The Yankees are banking on their ballpark being conducive to more homers, and they might be right. But even if they are, there’s also the fact that in two of the last four years, Ellsbury missed more than half the season with injuries. Like McCann, he’ll be 30 during the 2014 season. He’ll likely be an excellent player for several more years, but like the other free agents the Yankees signed — and like most free agents, period — he has probably already delivered his best season. There’s nothing wrong with any of these signings in isolation; all three guys are above-average players at positions of need. All three make the Yankees better. But their impact will likely be dampened by the player the Yankees let get away. The Mariners may or may not regret guaranteeing Robinson Cano 10 years and $240 million; there’s no doubt the Yankees will regret Cano’s absence in 2014. Cano does everything well. In seven of the last eight years, he has hit .300 and delivered more than 40 doubles. He has hit 25 or more homers in five consecutive seasons. He has steadily improved his plate discipline, now walking about 50 times a year under his own power, and he has never struck out 100 times in a season. He’s an above-average defender at a key defensive position. And despite playing second base, where making the double-play pivot with an oncoming runner from the blind side shortens seasons and careers, Cano has stayed incredibly healthy. Over the last seven years, he has missed 14 games — total. Cano was worth 7.6 Wins Above Replacement in 2013. McCann, Beltran, and Ellsbury were worth 10.4 bWAR combined. Losing Cano wipes out most of the gains made by signing the other three players, and while Cano will make $24 million in Seattle next year, the Yankees will pay the other three $53 million. It’s fair to ask how the Yankees, who never let their own premier players get away and who often spend a lot of money stealing away other teams’ free agents, could let the Mariners outbid them for Cano. The Yankees are always the cuckolders, never the cuckolded. When faced with the choice between throwing a ton of money at Cano or a ton of money at McCann, Beltran, and Ellsbury, the Yankees of old would have done both. In the last 20 years, the Yankees have never let a player remotely close to Cano’s stature get away. The only two premier free agents who left were Andy Pettitte and Roger Clemens, and both (a) were not nearly at Cano’s level at the time, and (b) signed with Houston at least in part for family reasons. The question is fair to ask, and the answer is fairly clear, even if it’s hard to fathom: The Yankees didn’t try harder to keep Cano because they don’t have the money. Or, at least, they’re choosing not to spend it. The Yankees, who have fielded a payroll in excess of $195 million for nine consecutive years, would like to keep their payroll for next season below $189 million, which would keep them under the luxury tax and reset their tax rate to the lowest level so that they’d pay less in taxes if they exceed the threshold in future years. The Yankees keep sending mixed messages about whether they’re committed to staying under the threshold next year, because while doing so may save them upward of $50 million in taxes in the long run, the attempt for fiscal restraint was partly responsible for them missing the 2013 playoffs, and it will probably keep them out of the playoffs in 2014. It’s hard to lop $30 million off the payroll in two seasons. The Yankees have done their best, using creative accounting when they acquired both Wells and Alfonso Soriano so that most of their payroll obligations showed up on their 2013 balance sheet. For 2014, Wells counts only $2.4 million toward their payroll, Soriano only $5 million. Even so, right now the Yankees have $172 million committed to just 13 players for next season. They will have to pay roughly $16 million to their five arbitration-eligible players, including the highly underrated Brett Gardner and new closer David Robertson. 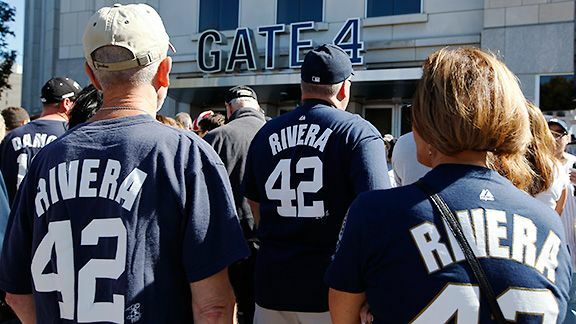 Even assuming the other seven spots end up being occupied by league-minimum players — and it’s possible the Yankees have never in their history had seven minimum-wage players on their Opening Day roster — that’s a commitment of roughly $192 million. The Yankees’ ace in the hole is the suspension looming over Rodriguez, as any salary he forfeits during his suspension would not count against the team’s payroll for luxury tax purposes. Given that Rodriguez is supposed to make $26 million next year, and his luxury tax hit is even higher,5 that’s not a minor consideration. 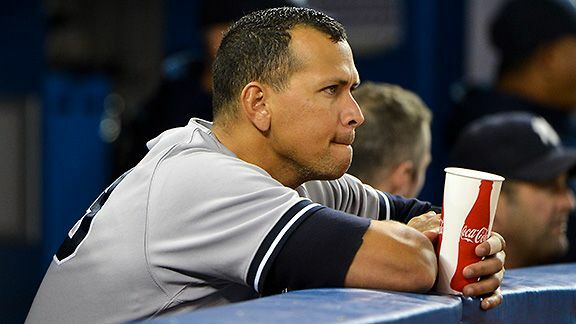 The problem for the Yankees is that there’s really no way to know how an arbitrator will decide Rodriguez’s case; both A-Rod and MLB have covered themselves in ignominy during this process. It’s a fair assumption that Rodriguez will have to serve at least the same 50-game suspension that every other PED abuser has faced, which would save the Yankees about $8 million and might allow them to circumvent the luxury tax if they don’t make any other moves. It’s anyone’s guess whether he’ll get a longer suspension, however. And even if he does, by the time the arbitrator rules, free-agent season will be almost over and there won’t be many players left to take the Yankees’ money anyway. These budget constraints have led to the Yankees losing out to one of the game’s small-market teams on a free-agent target two years in a row. A year after Martin signed with the Pirates, the Yankees targeted Omar Infante to replace Cano at second base, but bowed out when the Kansas City Royals — the Royals! — offered Infante a four-year, $30 million contract. Instead of Infante, the Yankees will reportedly pay the modest sum of $2 million to Brian Roberts, who is currently 36 years old, hit .249/.312/.392 in 2013, and hasn’t played more than 77 games in a season since 2009. Kelly Johnson, who also signed a modest one-year deal after hitting .235/.305/.410 last season, will fill in at second base when Roberts inevitably gets hurt and at third whenever Rodriguez’s suspension kicks in. Of course, that’s the other A-Rod factor the Yankees don’t want to discuss: They actually need him in their lineup. For all of his faults, and even at his declining age and after missing most of 2013 with injury, Rodriguez hit .244/.348/.423. Of the 17 players who batted 100 or more times for New York, only Cano managed a higher OBP. Now, when Rodriguez misses time, Johnson or Nunez will likely fill in at third. Jeter will return for one more year at shortstop, and aside from turning 40, missing almost all of last season with an ankle injury, and playing poor defense for the last decade, this should go great. (On days when Johnson plays second base, he and Jeter will form one of the worst defensive middle infields you’ll ever see on a putative contender.) The Yankees have signed Brendan Ryan as Jeter’s caddie; Ryan is an absolute defensive whiz … and has hit .196/.268/.275 over the last two years. Teixeira should return to man first base, but he’ll turn 34 in April and was in decline for three consecutive years before he missed almost all of last season. Soriano was excellent as the DH after coming over from the Cubs in 2013, but he’ll be 38 during the 2014 season and was so bad in Chicago that the Cubs paid three-quarters of his salary just to get the Yankees to take him off their hands. With or without Rodriguez, every member of the Yankees’ projected 2014 lineup will be 30 or older. Individually, old players can have surprisingly good years; collectively, old players decline. This is a lineup in decline, and parts of it weren’t that good to begin with. I haven’t even mentioned the pitching staff. CC Sabathia is 33 years old, and his average fastball velocity has dropped from 93.9 mph in 2011, to 92.4 in 2012, to 91.3 in 2013. All power pitchers have to learn to adjust to losing their fastball as they reach their 30s, and Sabathia is probably better than the guy who posted a 4.78 ERA last season, but his days as an ace may be over. Hiroki Kuroda is back for another year, but he’ll be 39 this coming season and posted a 5.40 ERA in August and September. Pettitte is retired. Phil Hughes, who was certainly a disappointment in New York, has signed with the Twins. Ivan Nova, who was quietly excellent in 20 starts in 2013, is now the no. 3 starter; the last two slots in the rotation will tentatively go to David Phelps, who didn’t reach the majors until he was 25 and has a 4.39 ERA in 23 career starts, and Michael Pineda, who was one of the best rookie starters in baseball two years ago — and, thanks to labrum surgery, hasn’t pitched in the majors since. The bullpen might be pretty good. It still won’t have Rivera. Looking at this roster, it’s difficult to imagine the Yankees keeping the payroll below $189 million. Actually, it’s unfathomable. They can’t do it, because the team just isn’t good enough. They have to improve by 10 wins on paper just to be on the fringes of contention, and they lost their best player, meaning they really need to make up closer to 18 wins. Ellsbury will make up a chunk of that, and McCann and Beltran will, too, but where else are the Yankees going to get better? Sure, they might be healthier this year, but can they really count on Jeter becoming just the second 40-year-old shortstop since 1950 (after Omar Vizquel in 2007) to play even 100 games at the position? And they didn’t only lose Cano. Granderson, who signed with the Mets, contributed some in 2013; Hughes made 29 starts, and they weren’t all terrible; even left-handed specialist Boone Logan signed elsewhere for more money. It’s possible the Steinbrenners will swallow their pride — and cancel the deposit on their next Gulfstream — and sign Ervin Santana or Matt Garza. That will certainly help the team in 2014, even as it kills profitability. Even that won’t be sufficient, though, because there’s simply not enough talent in New York right now. There also isn’t enough talent on the way. You’ll notice that, in this entire article, I’ve yet to mention a single prospect or rookie who’s ready to step in for the Yankees, giving them upside and youth in a nice, payroll-cleansing package. That’s because they don’t have any. While the Red Sox have Bogaerts and Bradley ready, the Rays have a full season of Wil Myers in store, the Blue Jays have Aaron Sanchez and Marcus Stroman, and the Orioles have the electric Manny Machado along with pitchers Kevin Gausman and Dylan Bundy, the Yankees have … bubkes. No rookies, no second-year players who might take a step forward. Their farm system is terribly weak; Jason Parks, the chief prospect guru for Baseball Prospectus, recently described it as “[Double-A catcher] Gary Sanchez and a list of interchangeable prospects with reliever profiles or bench futures.” By comparison, the Red Sox’s farm system is so deep that, according to Baseball America‘s Ben Badler, they may have as many as 10 of the top 100 prospects in baseball. The Yankees have been spending top dollar on free agents for decades, but when they were winning they always had a core of homegrown talent around which to build. Right now, Gardner is the only home-grown hitter in the lineup who was signed in the last 15 years. Nova and Phelps are the only homegrown starters. This is an entirely store-bought team, and the store doesn’t carry the inventory it used to. That’s why the Yankees’ problems won’t go away anytime soon. It wasn’t so long ago that the free-agent market was teeming with star players in their primes. Five years ago, the Yankees signed three of them in one offseason, inking Sabathia, Teixeira, and A.J. Burnett to long-term deals, then winning the World Series the next year. But the dramatic increase in revenue throughout the game has made it possible for even small-market teams to sign their best young players to long-term deals well before those players reach free agency, meaning that by the time they do hit the open market, they’re in their early 30s and declining instead of being in their late 20s and peaking. Andrew McCutchen won’t be a free agent for another five years. Buster Posey is under contract until 2022. Carlos Gomez is signed for three more years. Paul Goldschmidt is under the Diamondbacks’ control through the end of the decade. The best free-agent hitters likely to reach the market next winter are Hanley Ramirez, Chase Headley, and Colby Rasmus. The best pitchers — assuming Clayton Kershaw gets his long-rumored extension with the Dodgers — are Max Scherzer, James Shields, Homer Bailey, Jon Lester, and Jake Peavy. Some of these guys are going to sign extensions before they hit the market, and the Yankees will be fighting 29 other teams for the ones who don’t. If the Yankees wanted to make a truly big splash in free agency, they could have signed the best free agent we’ve seen in years, the one player who might have made the difference between being a contender in 2014 and being an also-ran. You know: Robinson Cano. The Yankees will sign someone next year, and the year after that, and the year after that. They’ll need to sign as many top free agents as they can every year, however, just to keep up with the ravaging effects that age will have on their current roster. Which players in the organization can be reasonably expected to be above-average contributors in three years? Sanchez. Maybe Ellsbury and McCann. Nova, if we’re feeling generous. Pineda, in an alternate universe where pitchers never get hurt. And that’s pretty much it. There simply won’t be enough talent available via free agency to replenish the Yankees’ needs. There’s nothing on the farm. And as a result of the new CBA, the Yankees can’t flex their financial muscle in the draft or on the international market. There’s a perception that the new CBA hurts small-market teams that want to spend on amateur players, but it actually hurts rich teams that want to blow the market away on elite young players. Carlos Rodon, the presumptive no. 1 overall pick in the next draft, could be a better version of David Price in a perfect world. In the old days, Scott Boras6 could work his magic, tell the world that his client wants $25 million to sign, and scare away enough teams to allow Rodon to fall to wherever the Yankees are picking. The spending limits in the new CBA make that much more difficult. If Rodon is the top player in the draft, he will almost certainly go no. 1 overall. The Yankees will have to settle for the best player on the board when they draft — and thanks to all the free agents they’ve signed, they will forfeit their first-round pick next year anyway. Even signing players from Japan has become more difficult; it used to be that teams submitted a blind posting bid in an auction, but now any team that posts the $20 million maximum can negotiate freely with the player involved. When ace right-hander Masahiro Tanaka gets posted — whether it’s this year or next — the Yankees will have to negotiate like everyone else. And if they do sign Tanaka, more of the money they commit to him will count against their payroll for luxury tax purposes because of the lower posting bid. The Yankees dug their own hole by making mistakes in drafting and player development. They’re even worse off now, however, because the ladders they used to climb out of a similar hole 20 years ago have been removed. There are again two great teams in the American League East, but they’re the Red Sox and the Rays. The Blue Jays and the Orioles, whom the Yankees finished ahead of in the standings for 16 consecutive years, are better than they used to be. Right now, it doesn’t look like this story will have a fairy-tale ending for New York. The culprit in the Yankees’ downfall is mundane, but real: They’re simply not talented enough to contend. Talent was something the Yankees could always buy in the past, but no one’s selling it anymore. With few ways to acquire that ability, it looks like the Yankees will be living unhappily — if not ever after, then certainly for a lot longer than their front office and fans are prepared to stomach. The Yankees aren’t irrelevant. They’ll always spend too much money and command too much media attention to be that. They’re simply not very good. Well, tied with the Cardinals. Boston and St. Louis each totaled 97 regular-season wins. In 1992, 1991, 1990, 1969, and 1967. If you’re wondering why a team’s Pythagorean record should matter at all, consider that it’s a better way to predict what a team’s record will be the following year than the actual win-loss mark is. The 2012 Orioles went 29-9 in one-run games, the highest winning percentage in such contests in major league history. This helped them to a 93-69 record and a wild-card berth despite outscoring their opponents by just seven runs. The 2013 Orioles were fundamentally better — they outscored their opponents by 36 runs — but their record in one-run games fell to 20-31, the third-worst record in the majors. They won just 85 games. With the caveat that I’m not a lawyer versed in the CBA: Rodriguez is in the middle of a 10-year, $275 million contract, and for luxury tax purposes, a player’s salary is averaged out equally over the length of the contract, which would make his “luxury tax” salary $27.5 million. I have no idea if Boras will represent Rodon. But Rodon is the best player out there, so let’s call it a safe guess.